While we realise that firewalls don’t mean much to the average computer user, they remain essential to your online security and can be complex to configure and install. The FusionNet firewall management service ensures there are no holes in your computer network, and takes care of everything from firewall selection, to configuration and maintenance. 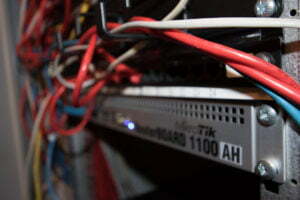 Our preferred devices are powered by the Mikrotik product range of firewalls and wireless access points. These offer more features than many high-end Cisco boxes, for a fraction of the cost. Fault-finding by enabling a device in debug mode. Using L2TP, PPPoE, PPP and most of the other Mikrotik / RouterBoard functionalities that are available.